I hope the Marines on this forum have a wonderful 241st Birthday. Happy Belated from a USAF veteran on Veteran's Day! My girl Gertie with me at the drive-in 2 months before she died. Missing her! I not only march to the beat of a different drummer I own the whole marching band! A belated happy Anniversary, especially those that fought Hitlarian Eugenics of whatever race, in the Two World Wars , with my Dad & Uncles & relatives, an unbroken debt, from this side of the Pond, Thanks. Favorite Pipe: Any of my 6 Gabrieli's, my 2 RD Pipes and 2 JZP pipes. Favorite Tobacco: Warrior Plug and War Horse Bar. We toasted the Corps last night at the B&M with a few formerly active Marines (they're never ex-Marines, are they?) I brought my Dad's Purple Heart that he earned for being wounded on Okinawa and they got a kick out of seeing that. 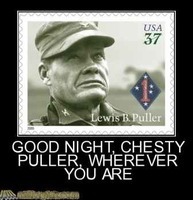 Semper Fi, guys. Army here. Was on the road all day yesterday, celebrating the holiday weekend today and tomorrow. Happy Veterans' Day to all vets.